Mean Girls meets Life of Pi in this darkly humorous, compulsively readable teen novel that’s perfect for fans of Libba Bray and Andrew Smith. 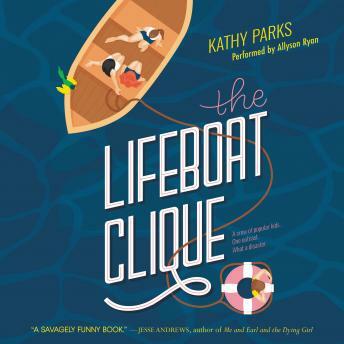 A hilariously dark and twisted story that sparkles with a remarkably fresh voice, The Lifeboat Clique is Kathy Parks's irreverent yet insightful novel about how to survive in the most unthinkable circumstances. Some people might say that Denver has a death wish. Why else would she dare to sneak into a Malibu beach party where she’d be surrounded by enemies? Oh yeah. Croix. Denver never thought in a million years he’d ask her out, but who is she to question this miracle of fate? Well, that isn’t the only surprise fate has in store. During the party a tsunami hits the coast of California, and Denver and a handful of others escape death and are swept out to sea. Of course, one of her fellow castaways is none other than her ex-BFF, Abigail, who can barely stand the sight of her. Trapped on a small boat with the most popular kids in school and waiting to be rescued, Denver wonders what might kill her first—dehydration, sunstroke, or the girl she used to think of as a sister?